A cool breeze blows through the covered courtyard providing some relief to the August heat. It’s way past sunset in a country where it doesn’t get dark until after 11PM. A Spanish guitarist strums his instrument with an overgrown, gnarled fingernail that doubles as his pick. To his side is another man who is keeping beat by clapping as his voice wails a sad, haunting song. There are others on stage as well. Many women dressed in colorful dresses with plenty of ruffles. Their dark hair pulled tight by brightly colored, ornate clips that glisten in the moonlight. We are deep in the south of Spain, in Andalucia. Suddenly, one of the ladies stands up with a determined look on her face. She has begun to feel the music and wants to dance. She stomps and moves across the floor. Twirling and clapping and stomping some more. She’s dancing as if all the pain and suffering in her life will be released in these heavy steps. She continues this maddening dance until she suddenly returns to the current moment and moves back to her seat. In flamenco, this would be called an arranque, or an outburst. But for me, arranque is also the best term to describe my culinary experience during my time in Spain. My love for cooking and baking started young. Each day, I would rush home from school to try a new recipe or help my mother with dinner preparations. During college, this passion continued to build by trying new recipes, cuisines, and ingredients on willing roommates. By senior year, we were hosting a weekly “family dinner” for friends who wanted to enjoy good food and company. I graduated and had more time (and money!) to spend in the kitchen so I continued to hone my skills. By the time I moved to Andalucia, this passion had met a fevered climax. But all the newness of my new home was overwhelming so I retreated to a space that had always brought me comfort, the kitchen. I began to explore Andalucia through its ingredients, spices and markets. I learned to cook local and in season. I wandered the grocery stores, drove through the pueblos blancos mountain villages to find the best olive oil and sampled sherry wine. I tried dishes I never thought I would, learned the language (my Spanish food vocabulary is still stronger than any other area! ), and began to grow into a confident cook. My husband and I started to travel outside of Spain to Italy, France and Morocco. Traveling with our stomachs quickly became our favorite way to explore each new location. We did cooking classes, sought out local specialties, and shared wonderful meals along the way. 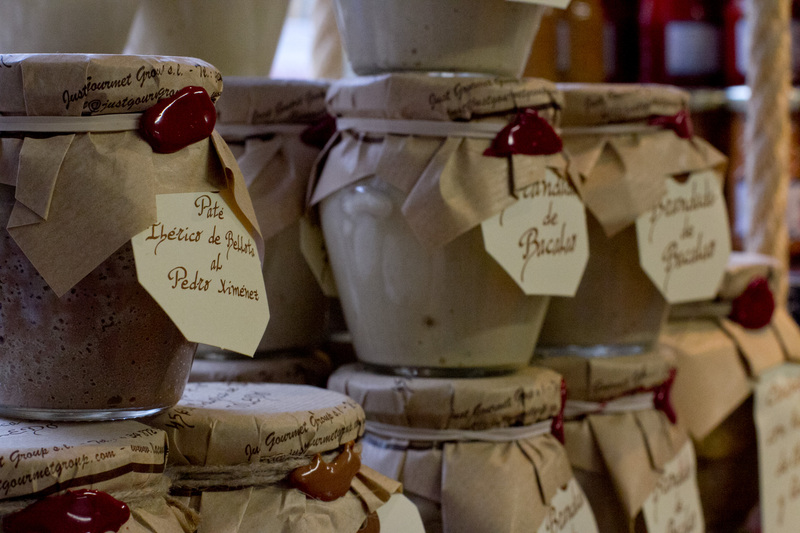 Our most common souvenirs were inevitably food-related items such as Parmigianino cheese, hefty red wines, spices, and local cookware. When we returned home, we would recreate these dishes in our kitchen and invite friends over to share in our travel memories around the dinner table. Basic ingredients creates a dish that transports me to Andalucia every time! It seems fitting that one of my favorite recipes to make when I’m missing Andalucia also has arranque in its name. This recipe was from my “hometown” of Rota. 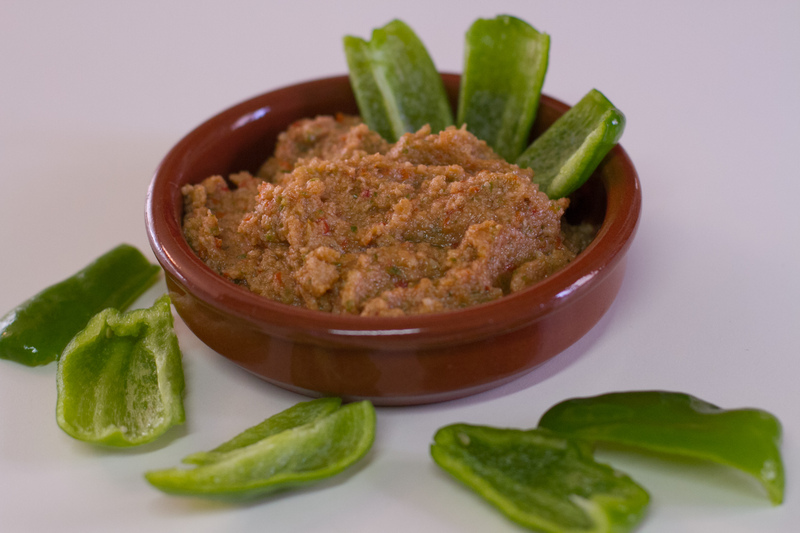 A close relative of gazpacho or Cordoba’s solemero, this dish is served as a dip. I loved the simplicity of this dish and how it takes me back to sunny Andalucia every time. 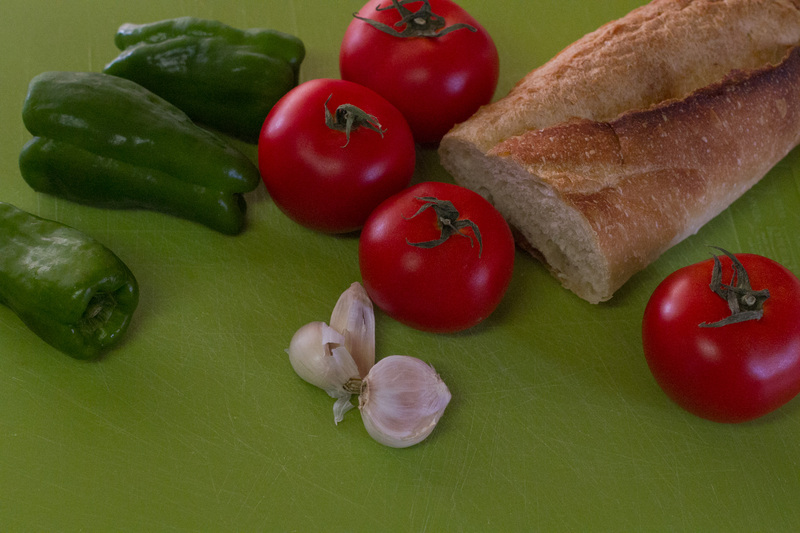 Blend tomatoes, green peppers and garlic cloves in a food processor. Next add breadcrumbs, olive oil and salt to taste until the texture thickens to your liking. Chill in fridge for 45 minutes before serving. Use sliced vegetables (green pepper slices are my favorite), picos or bread to dip. Serve with jamón serrano, Manchego cheese and olives. Serve with sherry wine for an authentic Andalucian experience. Note: This piece was originally created for Food52’s weekly “Food Memory” segment. I waited too long and they discontinued it so I thought I’d share here. 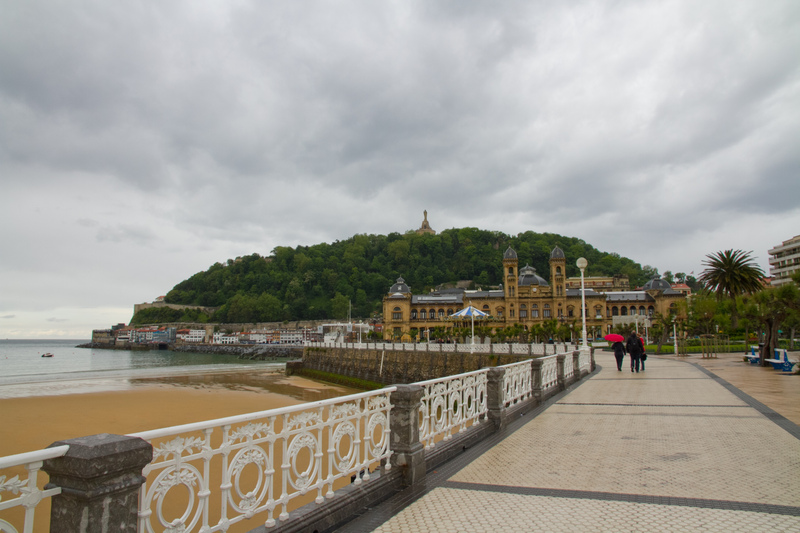 After a short 36-hour stay in Paris, we were off to San Sebastián in northern Spain. We decided that we would spend a few days checking out this foodie city since we never made it there while living in Spain. That may have been a good thing as I would be plotting to visit monthly if it was closer! Sadly, however, the weather did not cooperate with us. It rained the entire time we were there. Ok, it rained all but 2 hours of our time there! In those two hours, we hiked up Mount Urgull to get some stunning views of the city, sea, and famous La Concha beach. But the thing was that even with the rain, we were absolutely falling in love with San Sebastián. 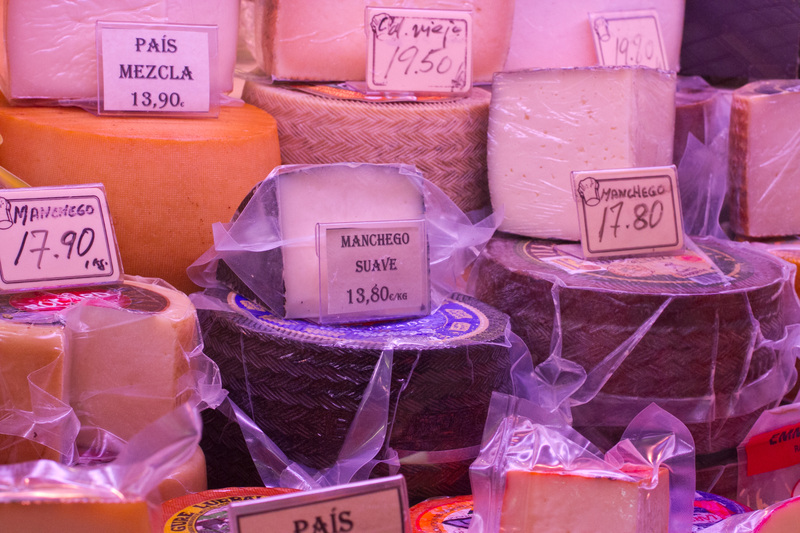 So when in Rome San Sebastián, you must join in the foodie culture! Therefore, we signed up for a tour with San Sebastian Foods. My friend Anne had recommended them (and she never steers me wrong!) 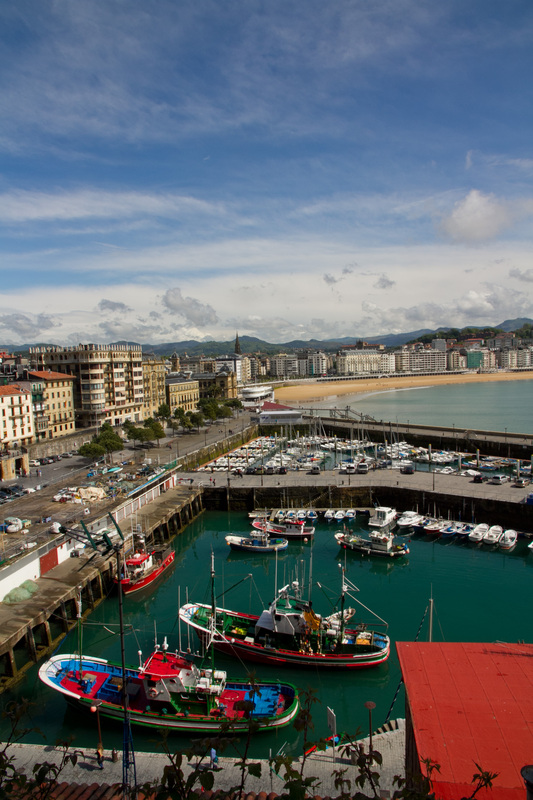 so we selected the Market Tour: Basque Food A-Z. We met at the San Sebastián Foods store on Calle Aldamar in the old city. Our tour guide Lourdes led us through basic introductions and gave us a quick overview of how the day would proceed. 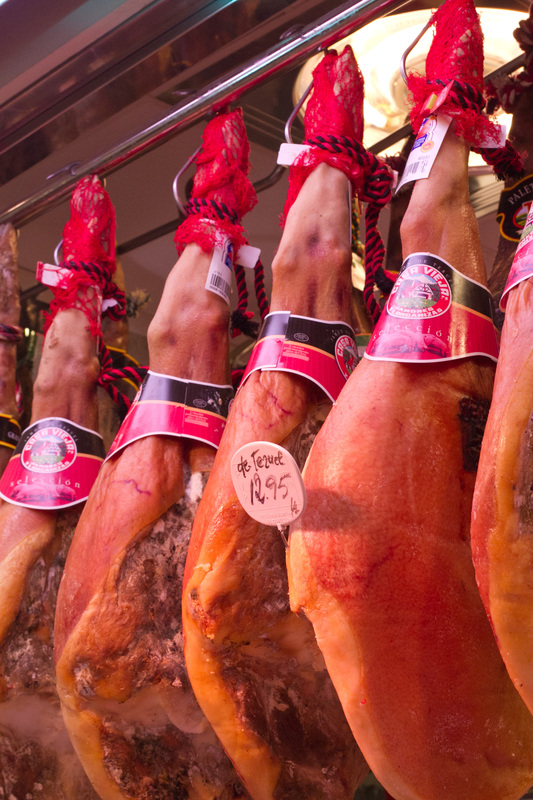 We would start at the local market, continue on to a local jamón shop, and then to enjoy some appetizers and wine at a gastronomic society. Lastly, we would move to a local restaurant for the main course and dessert. Yep, sounded like the perfect way to spend a rainy day to me! 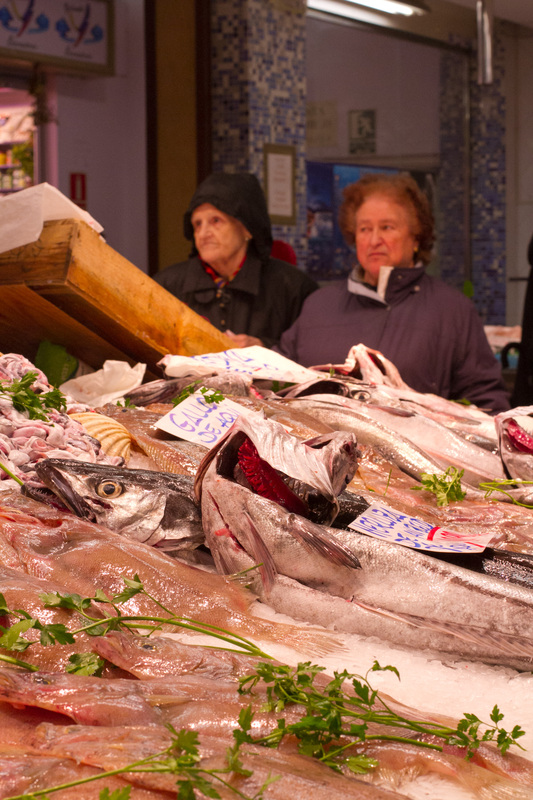 The market was like most other food markets I’ve been to in Spain. There has been a push to modernize many of the country’s outdated markets. The downside is that many of these food markets have lost their character but I guess it’s a price to pay for purchasing safe, quality products. The key difference was that I usually don’t have a fabulous guide like Lourdes leading me through it so I learned far more about this market than most others. She weaved the group through the market stopping at stalls to explain basic Spanish ingredients (with some samples! 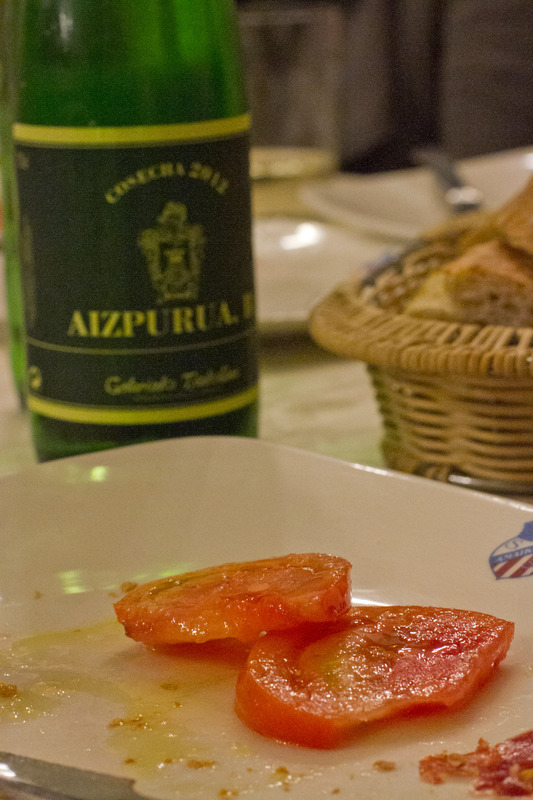 ), local Basque specialties, and throwing in tidbits of history and culture. On top of it, we were thoroughly immersed into the Saturday hustle of locals purchasing food for the weekend. It was great seeing the energy and passion for good food of this city! After the market tour, we ventured out (yes, in the rain) to a local jamón shop. Lourdes explained the different types of jamón. My husband and I are pretty well-versed in the varieties and quality after having lived in Andalucia for several years but we were blown away by the samples the shop provided. They didn’t hold back in offering up some of the best jamón around! We then headed to a local gastronomic society. Food geek alert…I was so excited to see this was part of the tour! I was fascinated by the concept and excited to learn more about it. 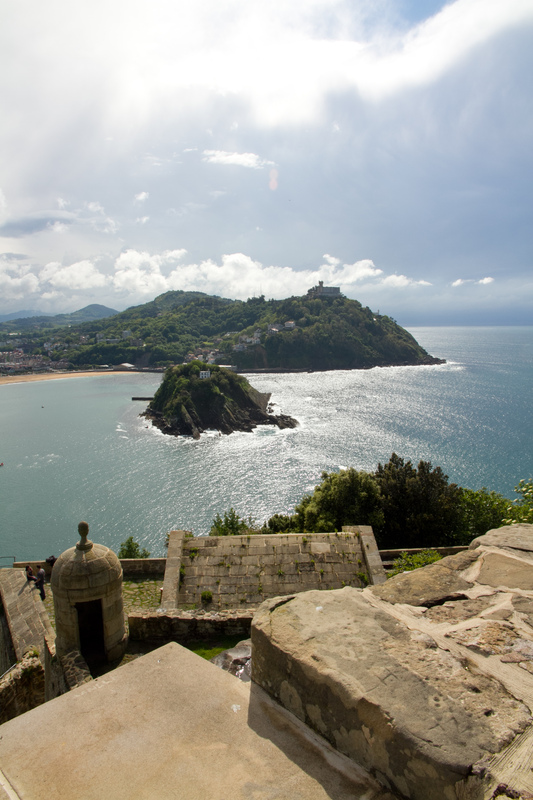 In short, gastronomic societies have been in San Sebastián for over a century. These all-men brotherhoods were originally founded to create a meeting place for free conversation and drinking without government regulations or oversight. Over time, the focus of these societies has shifted to cooking and camaraderie of its members. They meet to shop for fresh ingredients, cook up food for their friends, play cards, socialize, and drink. Now it begins to make sense why San Sebastián has some of the best restaurants in the world, eh? So a man would join a society and then head there to hang out with his friends while cooking, or eating, delicious food. As Lourdes told us, the wives felt comfortable knowing that their husbands were hanging out with a bunch of guys than doing who knows what! The men served us the local wine txakoli (wish I could find it here! ), tomatoes drizzled in olive oil, and morcilla (blood sausage) that was warmed to a spreadable consistency. The bottles of wine kept coming and by the end, we were all a merry bunch. The members of the society wanted to take pictures of us so they snapped away as we stood there happily buzzed off good food and wine. They even passed out their business cards in hopes of receiving postcards from around the world which they display in their society. Yep, there should be one of Mt. Fuji in there by now! 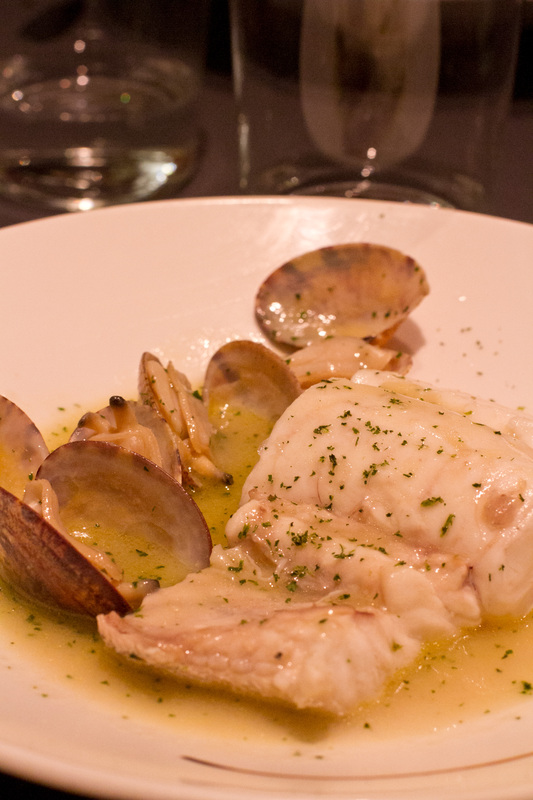 Fish and clams in garlicky sauce was perfection! The last part of the tour was a local restaurant where we enjoyed a main course and dessert. We were served a firm white fish with clams in a garlicky broth (there was a non-seafood options if coordinated beforehand) and red wine. 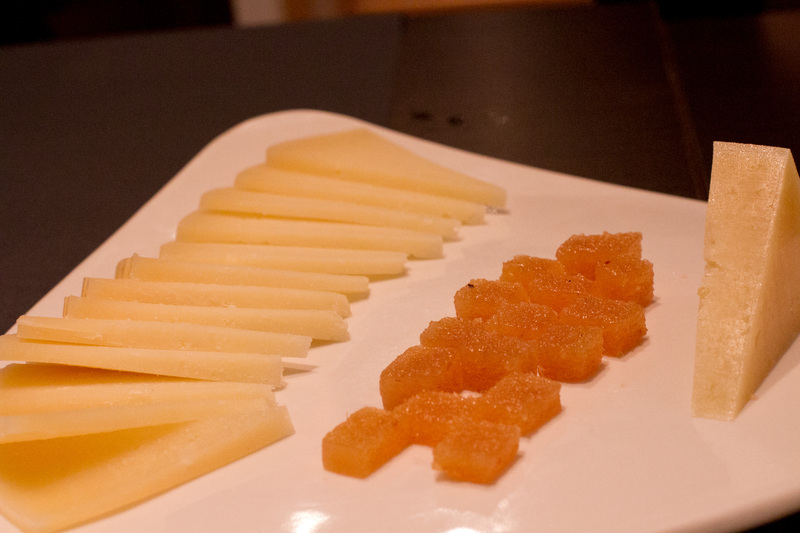 Then it was time to move onto dessert, local cheeses and membrillo. I was full but cannot resist membrillo. This was my first taste after several years, and it was magical. Firm and sweet; the perfect balance to the salty tang of the cheese. During the entire tour, Lourdes answered any questions about food, the local culture, Basque Country, and more. I really appreciated her openness to all topics that were discussed. I learned an incredible amount about Basque Country and its people as well as Spanish food in general. I love food tours because when you sit and “break bread” with others, you feel like family by the end. This experience was no different. We felt that we were in the company of good friends and even made plans to go pintxo-hopping with some other tour participants that evening. When I return to San Sebastián , signing up with San Sebastián Food will be the first thing on my list! They offer a variety of tours from evening pintxos hopping or dinner at a sidra (cider) restaurant to cooking and bread-making classes. They have also revamped their corporate branding to now include food styling classes as well. Sigh, I must figure out a way to return SOON…. This is by far my husband’s all-time favorite dinners! It’s been in our cooking binder for years. 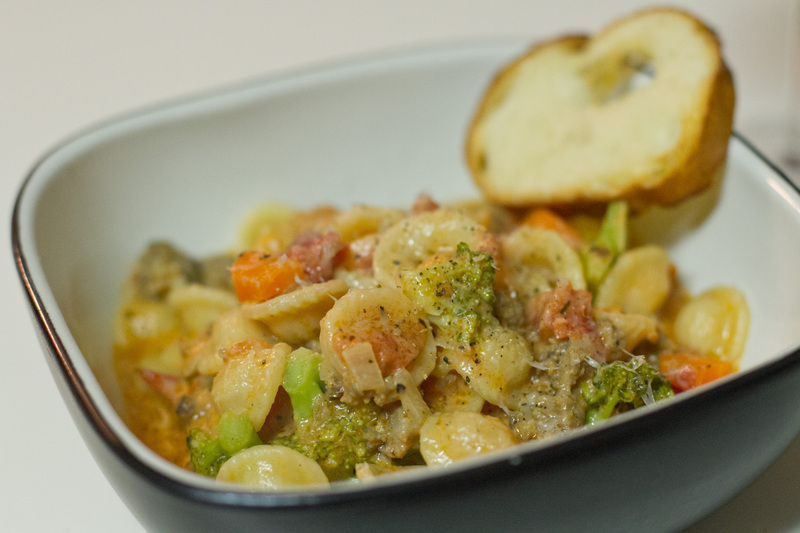 It’s a great pasta dish that tastes as good the next day (hello leftovers!) as the day of. I hope you enjoy it as much as we do! Bring a large pot of water to a boil. Add salt and toss in the carrots. Cook for approximately 2 minutes and then add broccoli. Cook for an additional 1-2 minutes. Strain vegetables and plunge into ice bath. Heat oil in heavy large pot over medium-high heat. Add shallots and garlic; sauté until beginning to soften, about 3 minutes. Add sausages and sauté until no longer pink while breaking up the sausages. Add cream; simmer 5 minutes. Add tomatoes with juices and sage. Simmer until sauce thickens, stirring occasionally, about 10 minutes. Add broccoli and carrots to the sauce and simmer for an additional 5 minutes. Meanwhile, bring a large pot of salted water to a boil. Cook pasta according to directions or until just tender but still firm to bite. Drain pasta, reserving 1/2 cup cooking liquid. Return pasta to pot; add sauce. 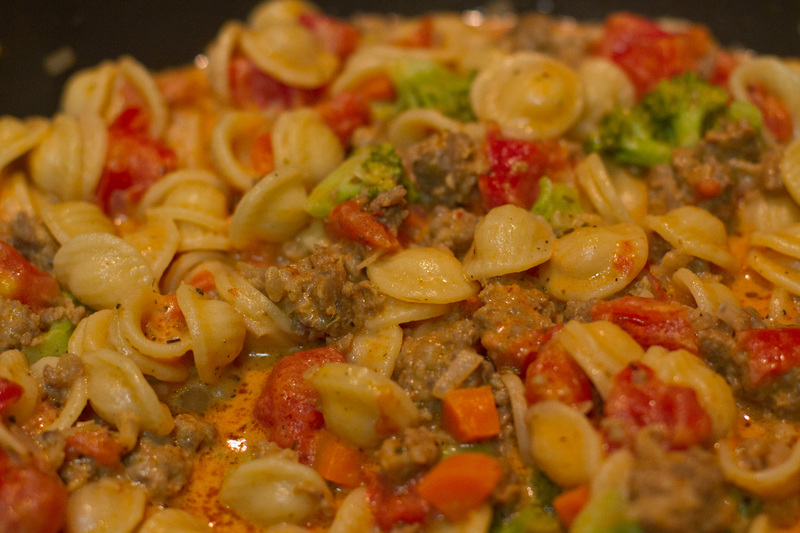 Toss over medium heat until sauce coats pasta, adding reserved cooking liquid by 1/4 cupfuls if mixture is dry. Season with salt and pepper. Sprinkle with cheese and serve. Talk about starting our European trip off right! We had only flown into Paris from Narita the night before but I was up early for my French baking class at Cook’n With Class. Anxious to get in the kitchen and (fingers crossed) learn to make pan au chocolat, I rushed off with barely a nibble at my B&B’s breakfast (though it looked amazingly good). Nothing could get between me and some delicious pastries! 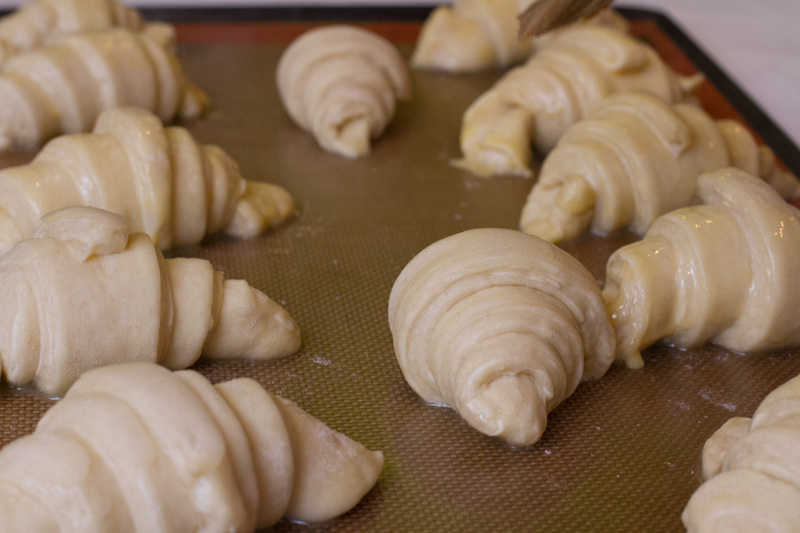 Croissants ready for the oven! It has long been a dream of mine to take a cooking class in Paris. I’ve done cooking classes around the world and it’s my favorite ways to experience a culture while traveling. The last time I was in Paris in 2010, the cooking class craze hadn’t totally caught on so all courses were insanely expensive. Now, there are numerous options to suit all budgets around Paris. I was a bit short on time so I selected this cooking school because it was highly recommended by our B&B and it was very conveniently located less than 5-minutes from where we were staying. A little before 9AM, I met the group with whom I’d be sharing the morning baking experience. We were a mixed bag of Americans from all across the country and a young lady from Istanbul who owns a cake and sweets business. We made quick introductions and chatted about our experiences so far in Paris. Several of the students had signed up for several classes and were raving about the other courses (sad face; I could only take one!). At 9 o’clock, we promptly started with Chef Briony explaining the class’s agenda so we could get the most out of our three hours. Due to the time required to prep and let the laminated dough rest, it had been prepared beforehand. We would create all of our pastries and while they were baking, we would go back to square one and learn how to make the laminated dough. And with that, we were off! First up was the custard cream for the raisin and fresh fruit danishes. This versatile cream came together very quickly under Chef Briony’s expert eye. Once completed, it was placed on a plate (more surface area so it chills faster – why did I not think of this?!) and covered with plastic wrap to chill in the refrigerator. Next we learned pound out the laminated dough to begin making the pastries. 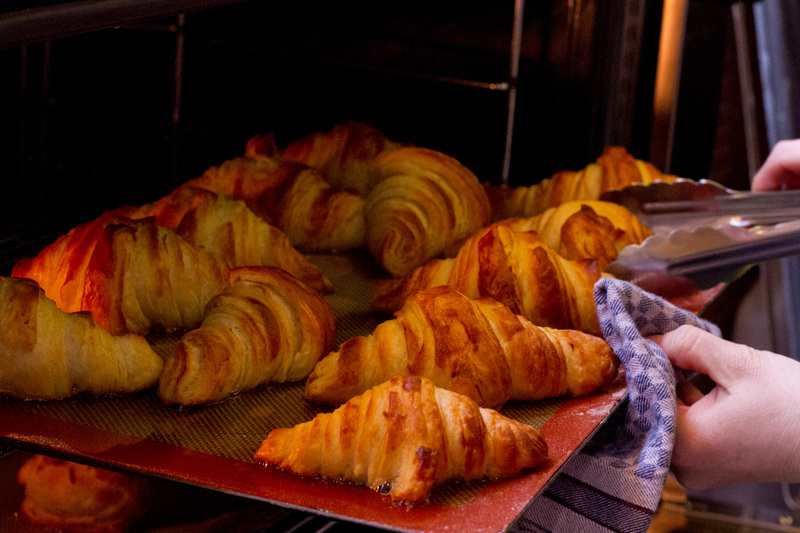 Laminated dough is pastry dough that is layered with butter. It is folded in a specific sequence to create numerous layers that puff up to become light and flaky. This type of dough is used for all sorts of breads and pastries like pan au chocolat, danishes, and of course, the infamous croissant. 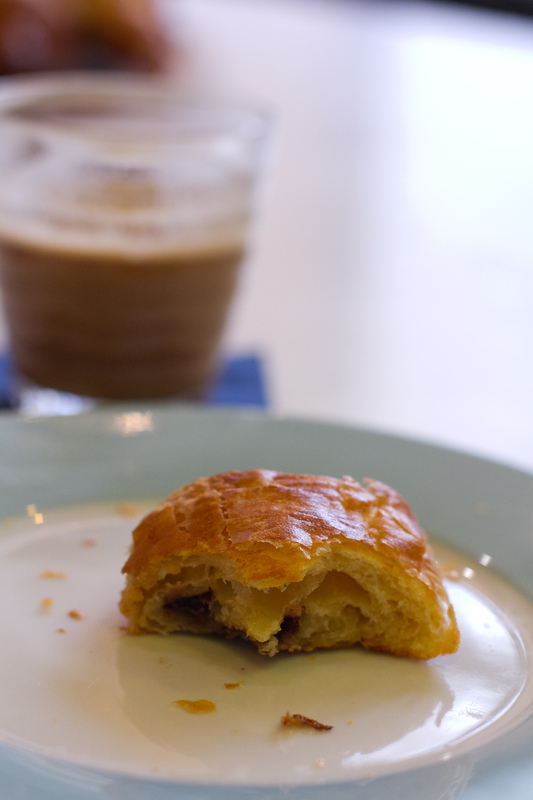 So began the task of running through and learning how to proper prepare the croissant, pan au chocolat (YAY! ), raisin danish, and fresh fruit danish. It was a delicious sugar rush! 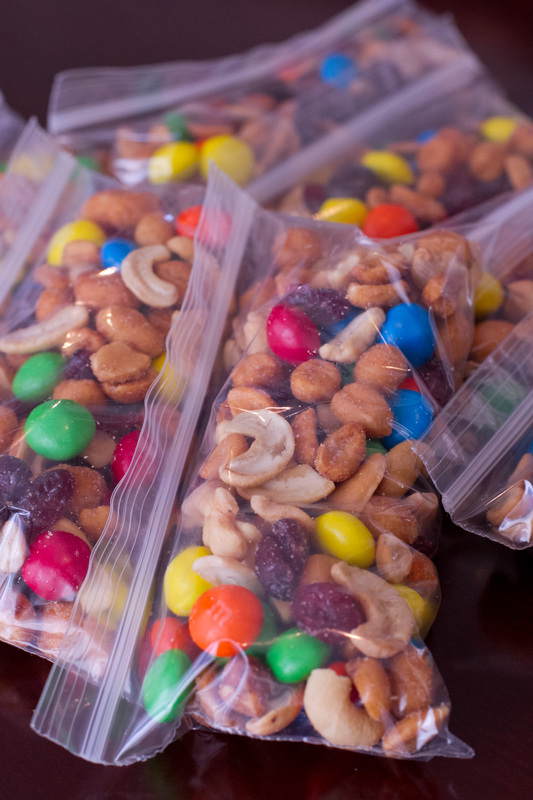 I won’t bore you with the details but we each got to try our hand at making each variety before prepping them to bake. Along the way, we learned tricks of a pastry chef and tidbits on how to incorporate it into a home kitchen. Plus there were plenty of laughs, pictures, and fun. Once everything was done and resting, it was time to learn how to make laminated dough. 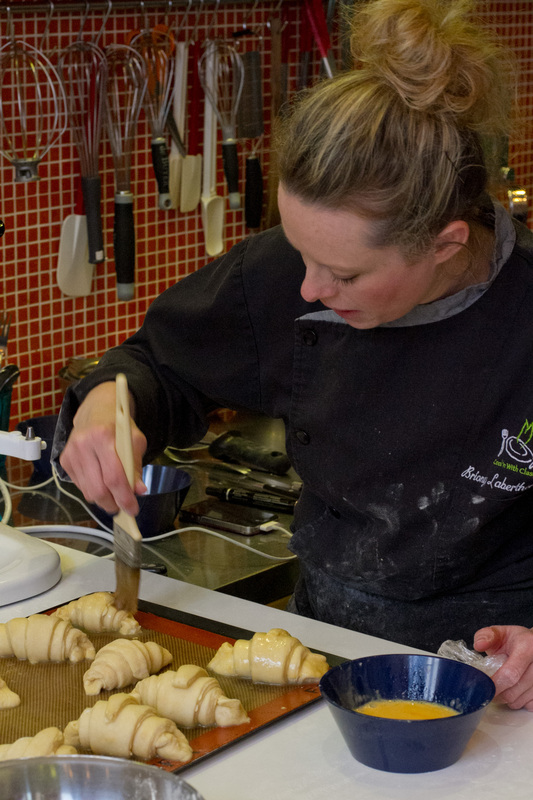 Chef Briony demonstrated how the dough was prepared in a KitchenAid mixer. Then she demonstrated how to pound out the butter with precision before it melted. You must move very, very fast during this stage! We took turns pounding the butter and dough. Next up was learning how to properly fold the dough to create the layers. We practiced folding it in a very exact sequence that pastry chefs learn quickly (lucky for us, they provide you with a video along with the recipes so no need to take detailed notes during the class). We had completed the hands-on portion with precision! At this point, the pastries were baking and smelling delicious so we cleaned up the table, washed our hands and sat down to enjoy our creations straight out of the oven. An interesting tip was that croissants shouldn’t be eaten warm as they need to cool for the flaky layers to form which is why you never get a warm croissant from a good French bakery However, we were too anxious to try them so we immediately dug into croissants, pan au chocolat, and danishes with a strong cup of coffee. I would definitely recommend taking a class through Cook’N With Class. I really wanted to do the macaroon class but with only 24-hours in Paris, I couldn’t make it happen. 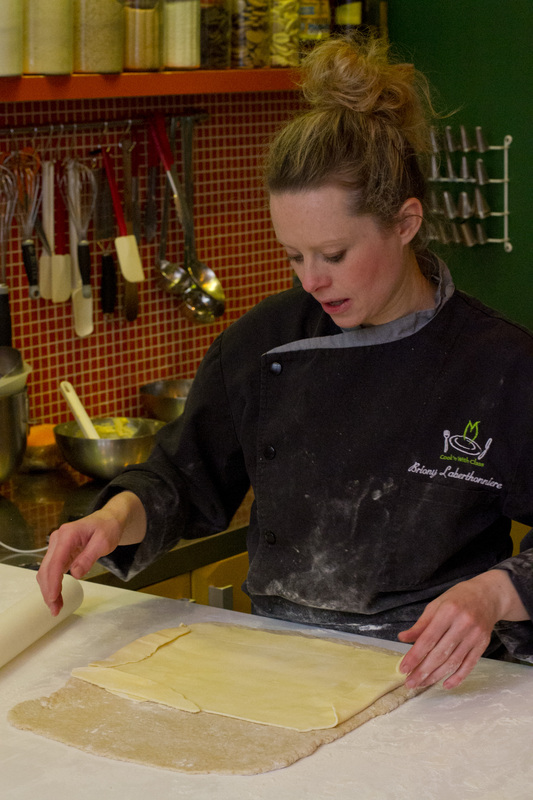 They offer several classes from market tours with dinner to French Desserts, Macaroons, and more. I will definitely be participating in another class next time I’m in Paris. Japan is hot, hot, HOT right now! And that means ice cream season at our house! There’s nothing I want more on a hot and humid day than a bowl of deliciously cold ice cream. During this time of the year, our ice cream maker is always out, with the extra canister in the freezer waiting to be called to action. My favorite ice cream cookbook is Jeni’s Splendid Ice Cream at Home. I stop by her shops every time I’m back home visiting family in Columbus, Ohio. Her unique flavors are well-balanced and always leaves me wanting more. You can imagine how ecstatic I was when I heard she was coming out with a cookbook. I was probably one of the first to pre-order it! Her recipe for vanilla bean ice cream has always been one of my favorites and I truly didn’t think it could get much better. That was until I made miso caramel from the Food52 website (which if you haven’t checked it out, go now!). 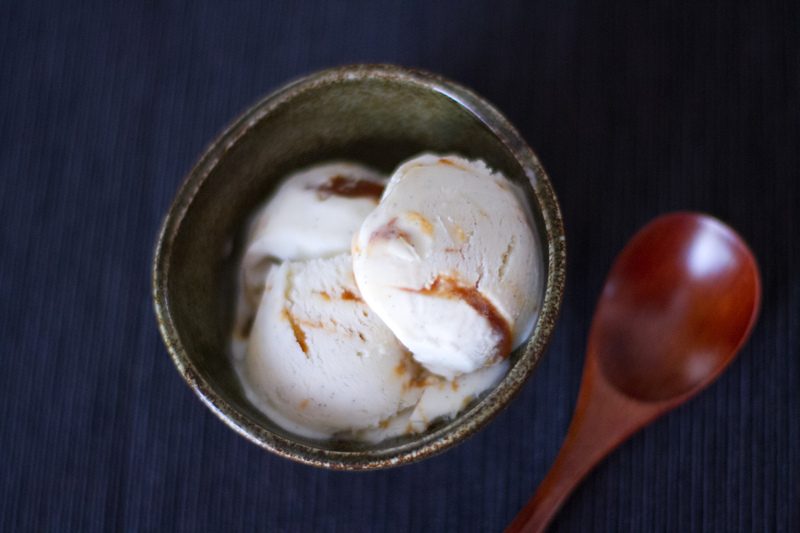 As I was debating how to use this miso caramel, I realized that the vanilla ice cream would be the perfect pairing. Seriously, it’s one of those knock-your-socks off recipes. From the day I made it, my husband has been begging me to make it again. I finally relented after I tried a few other ice cream recipes to mixed reviews (in case you’re wondering, they were NOT Jeni’s recipes). It’s sweet. It’s salty. It’s gooey and warming. 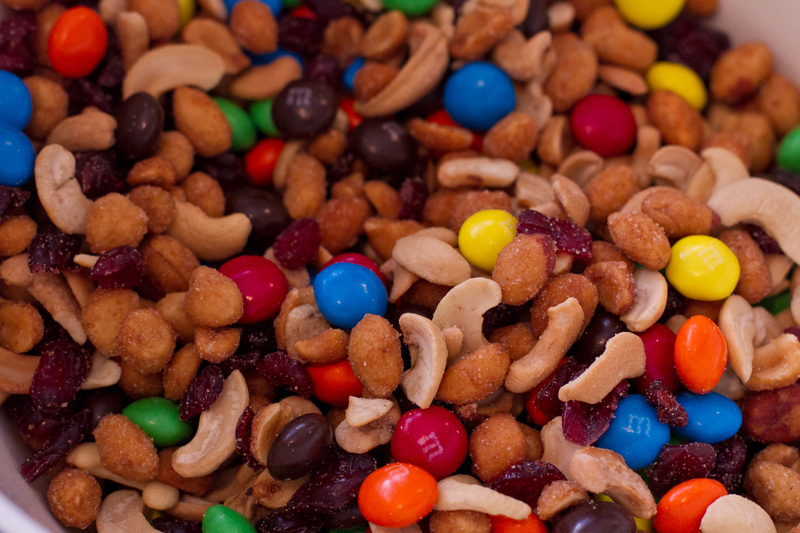 I would eat an entire batch if I could! Give it a try and let me know what you think. 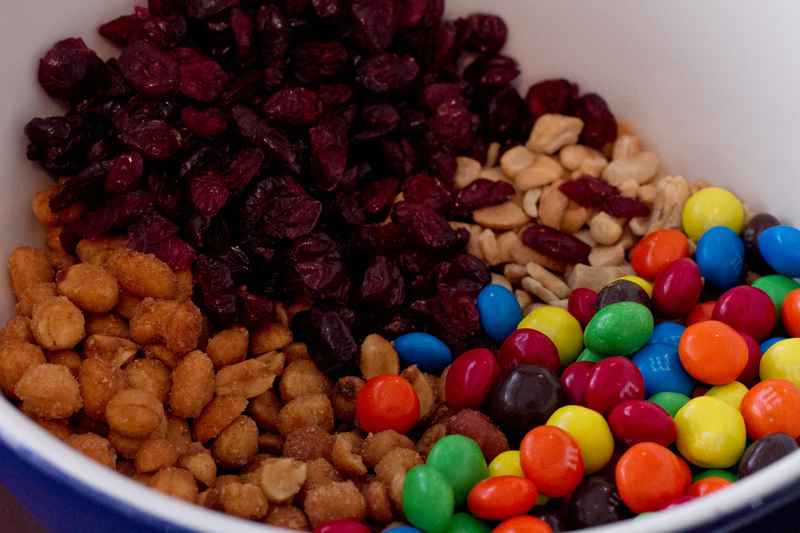 Fill a large bowl with ice water. In a small bowl, mix 2 tablespoons of the milk with the cornstarch. In another large bowl, whisk the cream cheese until smooth. In a large saucepan, combine the remaining milk with the heavy cream, sugar, corn syrup and vanilla bean and seeds. Bring the milk mixture to a boil and cook over moderate heat until the sugar dissolves and the vanilla flavors the milk, about 4 minutes. Off the heat, gradually whisk in the cornstarch mixture. Return to a boil and cook over moderately high heat until the mixture is slightly thickened, about 1 minute. Gradually whisk the hot milk mixture into the cream cheese until smooth. Whisk in the salt. Set the bowl in the ice water bath and let stand, stirring occasionally, until cold, about 20 minutes. Strain the ice cream base into an ice cream maker and freeze according to the manufacturer’s instructions. Layer the vanilla ice cream with miso caramel in a plastic container. Once all ice cream and caramel is used, you can swirl with a knife. Press a sheet of plastic wrap directly onto the surface of the ice cream and close with an airtight lid. Freeze the vanilla ice cream until firm, about 4 hours. In a heavy saucepan set over medium-high heat, stir together sugar and water. Without additional stirring, bring mixture to a boil. Use a wet pastry brush to wash down any sugar crystals that form on the sides of the pan. When sugar becomes a deep golden brown and wisps of smoke just start to form, remove pan from heat. Once off the heat, carefully pour in the cream, which will cause the caramel to bubble. Stir to combine. If the caramel seizes up and hardens with the addition of the cold cream, then put the pan back over low heat and stir until the caramel is liquid again. 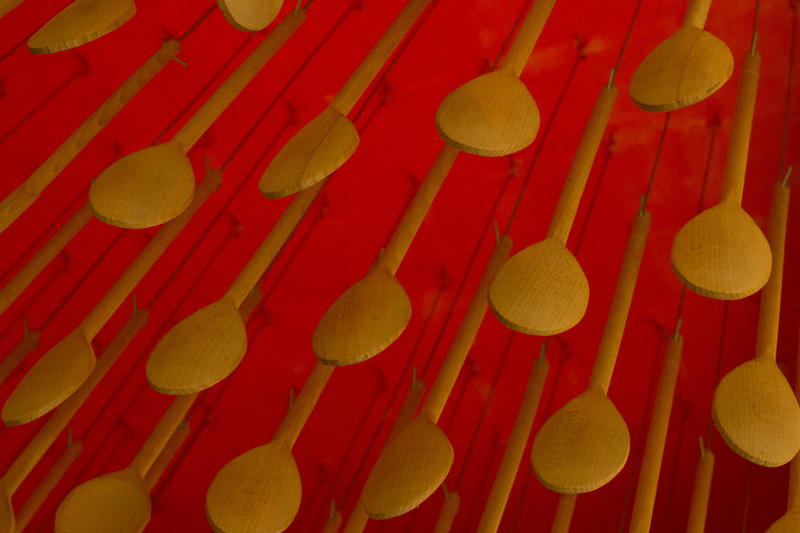 Whisk in the miso.